Spotlight is a rapidly deployable and flexible broadcast equipment telemetry platform for monitoring broadcast networks. Spotlight supports SNMPv2 and XML/HTTP polls and provides multi-tenanted monitoring interfaces to allow service providers' clients to monitor their own broadcast chains. 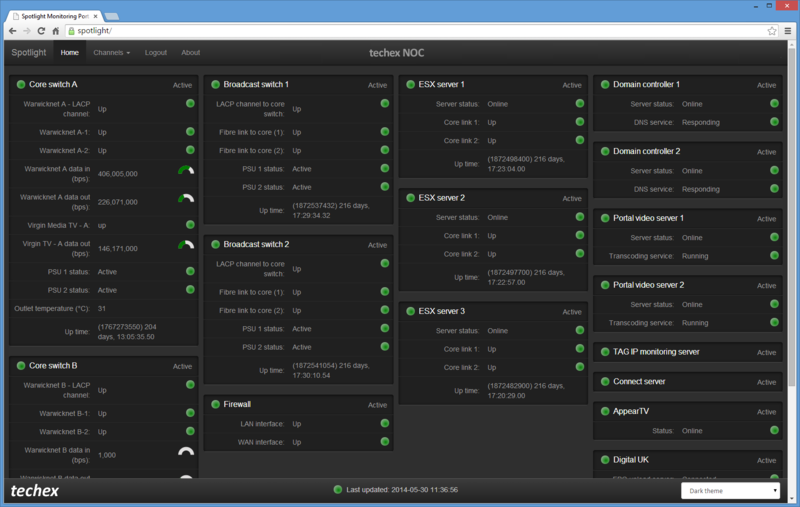 Spotlight was built from the ground up to offer a flexible and open platform to monitor broadcast infrastructure. It is designed to give operators and their customers an instantaneous health status of the complete network. An in-house designed analysis engine contacts devices on a round-robin basis using a wide variety of protocols including, but not limited to, SNMP, HTTP API, SSH. The engine can even revert to secondary techniques such as text file input and screen scraping to integrate with devices where no suitable API exists. EIT P/F data can be retrieved from standard TS probes and integrated into the web view. Input data is then displayed to the user in a customisable view. Data values can be harmonised to create common terminology, enabling operator consumption of information from disparate devices. Alarm thresholds can be customised for each polled value, and the alarm data presented as virtual LEDs or gauges on screen. In IP broadcast networks, where IP video feeds are available, Spotlight can integrate vision monitoring directly into the cross-platform web interface. 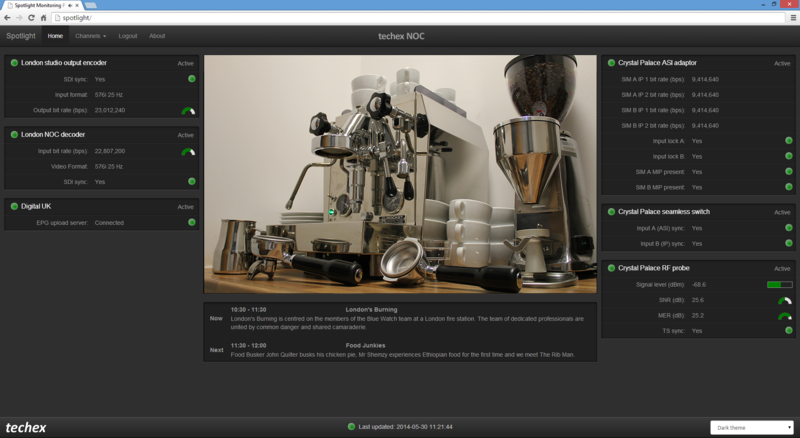 The interface is designed to support PC, Mac, Linux, Android and iPad/iPhone out of the box.